Hi. My name is Sian, and I am the founder of the Rhino Run. 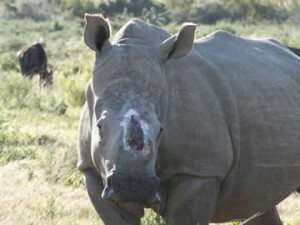 In March of 2012, a poaching event happened at the Kariega Game Reserve, close to my home city of Nelson Mandela Bay in the Eastern Cape Province of South Africa. 3 Rhinos were attacked by well equipped poachers who, using veterinary tranquilisers to first immobilise the animals, then proceeded to hack the horns off the (still awake but immobile) animals using crude bush machetes and axes. One of these 3 rhinos unfortunately died on the day of the incident, but the other 2, who were to become famous around the world as Thandi & Themba (Xhosa words for Love & Hope), survived. The video of how these animals were discovered can be seen below (a word of warning – it is quite graphic). In it you will see Dr William Fowlds give the 2 surviving rhinos the antidote for the tranquiliser. It was when I saw these poor animals come around and start to move, each to discover half of their face had been crudely and barbarically hacked off, that I realised I could no longer sit on the sidelines to such horrendous acts of cruelty. Themba sadly succumbed to his injuries a few weeks later and passed away, but despite unbelievable odds, Thandi survived, and it is this amazing rhino’s story of survival and courage that inspired the Rhino Run. 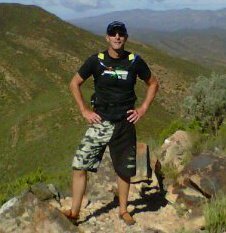 Being a trail runner has brought me in touch with the amazing beauty that is South Africa, and the wild places that this beautiful country has to offer. I believe that we as trail runners have an obligation to step up and fight whenever our precious natural resources are being threatened, for without them, we would not be able to do what we all love doing – running free! The rhino, being one of the Big 5, is an icon for this country, and we simply cannot let them die out – especially not for something as selfish as the greed of man! Braam Malherbe, one of South Africa’s running inspirations, says we should all, every day, just Do One Thing (DOT) if we believe in something. Stop talking about what we want to do, or would like to do, or think we should do, and simply just do it. And so, the concept of the Rhino Run was born – this is my way of trying to Do One Thing that might help in the war on Rhino Poaching. My dream for this event is to make it the biggest single day trail running event on the planet! I want to have people running on their favourite trails the world over for an entire day, all with one single objective – to raise funds and awareness of the war on rhino poaching. The only way we will win this war is to ALL band together – no matter where in the world you are, you can help. And if you are someone that enjoys being outdoors, then you have an OBLIGATION to help. Sign the petitions, raise awareness by spreading the videos and horrific images, join the vigils, volunteer in the parks and reserves if you are able and if you can afford to, donate to the various funds that have been set up to help. Our dream is to turn The Rhino Run into the biggest 1 day trail running event in the world by hosting Rhino Runs all over the planet, and at the same time uniting the global trail running community in a common cause – that of protecting and saving our rhinos! Just imagine – we could almost shake the world with all those feet running at the same time! So, if you are a runner – please take part in the Rhino Run – I can personally GUARANTEE you WILL be making a difference! In the five years to date that we have held this event, we have raised R705,000.00 for our beneficiary funds. As we go into the 6th year, our hope is that we will continue grow this event beyond the borders of South Africa, and that we will be able to raise even more funds for our beneficiaries. Outraged SA Citizens Against Poaching was a Facebook group that was started in mid 2011 when the Rhino poaching problem in South Africa reached epidemic proportions. Within the first couple of months membership soared and various initiatives were undertaken to bring about worldwide attention to the poaching crisis. OSCAP is now a fully registered NPO and works closely with other Rhino groups, NGO’s, local and International Wildlife agencies as well as local and provincial government departments in order to assist where ever possible. The Chipembere Rhino Foundation is a privately run, non-profit organization committed to assisting in the protection and conservation of Africa’s rhino. They are active with projects that involve collaring and tracking rhino, as well as training and equipping anti-poaching units. 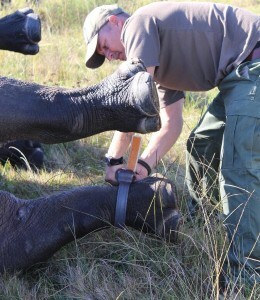 We added STS as a beneficiary in 2015, as we believe strongly in the work they are doing to help with rehabilitating rhinos that happen to be unlucky enough to survive a poaching attempt. These vets and specialists face the brutal aftermath of poaching, and yet they still return, day after day, to help save these amazing animals. The most famous rhino they are currently treating is known the world over as Hope, and her story of survival, along with the story of our own mascot, Thandi, serves to give us all hope that we can win the war on poaching. The story of Thandi and Themba is part of the much broader issue of rhino poaching – an issue which we cannot fight alone. Kariega actively supports the Forever Wild Rhino Protection Initiative of the Wilderness Foundation and the Rhino Project of the Endangered Wildlife Trust. Both are incredible organisations which have our full trust and support in all their commendable endeavors toward saving the rhino. This is the video that inspired The Rhino Run. Please beware – it is extremely graphic, and it will probably leave you feeling angry and horrified. I urge you to take those feelings and find a way to channel them so that you too may do one thing and together we will beat this problem.